Late last year, we asked climbers to write to the Niagara Escarpment Commission about potential changes to the Niagara Escarpment Plan which would severely restrict climbing access. Thanks for all your support during the recent Niagara Escarpment Plan consultation. We believe that it made a difference in the final Staff Recommendations, which came out in December. Here’s an update about the Plan amendment process. This January, the OAC confirmed that the Proposed Plan includes amendments clarifying that climbing may continue in areas where there is a history of climbing. It should be noted that climbing may continue. It is thus vitally important that climbers, like all user groups, continue to act responsibly. Climbing will continue to be allowed in a Nature Reserve where it is an existing use, and is generally allowed outside of Nature Reserves, subject to management plans. This represents a significant win for the climbing community and stands as an example of what we can accomplish when we come together as a community. While this recommendation is less than we asked for, it is something that we can live with. We at the OAC currently believe that this will not affect climbing at some of our highest-profile areas like Lion’s Head. 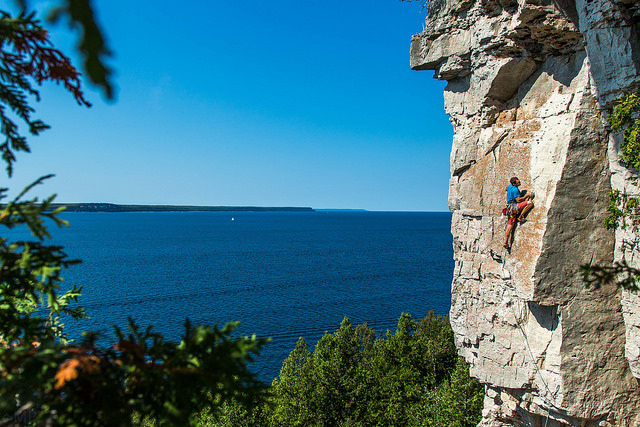 We will continue to advocate for climbing access throughout Ontario. The OAC will be calling on the climbing community shortly in an effort to address long-held climbing closures in Provincial Parks. Get involved, stay informed, and climb safe.